One year old, but one year wiser? On Aug. 10, 2015, Google announced that it was folding itself into a new parent company, which it was calling Alphabet. A year later, it’s not entirely clear what’s really changed. At first, it seemed like the move would help Alphabet keep key people like Sundar Pichai (by being able to promote him to CEO of Google), complete big acquisitions more easily, and report with more transparency on its various projects. While Pichai has indeed taken the helm and done a solid job of growing Google’s core business in the last year, Alphabet has not bought any massive companies, nor has it provided much more detail on the inner workings of its other projects. 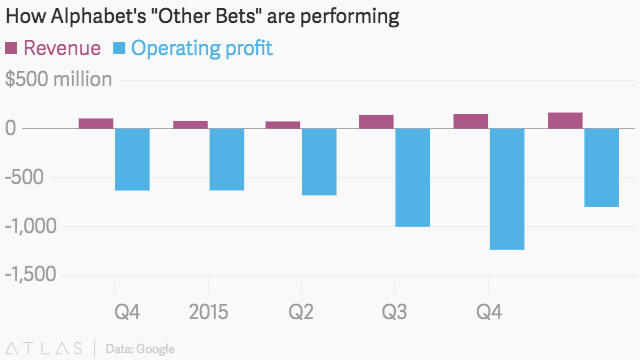 In reality, all we now know is that “Other Bets” is a massive money pit that hasn’t shown any signs of producing new businesses that could rival Google’s advertising business in terms of size or revenue. 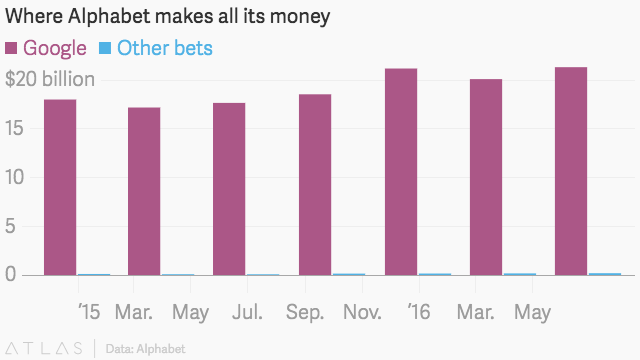 Google is still growing—its revenue last quarter was $21.3 billion, up 21% from a year earlier—but similar signs of life have not been seen in Other Bets. In the last four quarters, it’s lost over $3.7 billion, and only generated roughly $500 million in revenue, which works out to less than 1% of Alphabet’s quarterly sales. Alphabet’s Other Bets includes things like Google Fiber, the company’s initiative to bring high-speed fiber-optic broadband to the US; Boston Dynamics, a research firm working on humanoid and dog-shaped robots for the military; and Nest, the internet-of-things company Google bought in 2014 that makes smart thermostats and other as-of-yet unnecessary gadgets. In the last year, Nest’s CEO Tony Fadell has left Alphabet amid claims that he was creating a “toxic” work atmosphere, and Boston Dynamics is apparently being shopped around for a buyer as Alphabet struggles to monetize its work. Last year, The New York Times said Google was restructuring to “keep its lead as an innovator.” It’s certainly still very early in Alphabet’s life, but so far it’s been hard to see a future for the company that isn’t still dominated by Google’s advertising business. 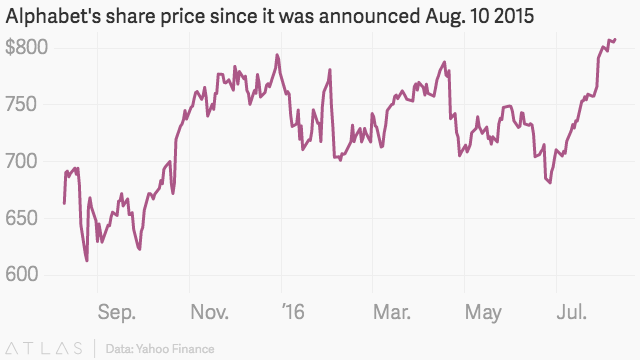 But as the company celebrates its first birthday, Wall Street doesn’t yet seem particularly concerned with Alphabet’s current lopsidedness—the company’s share price is currently flirting with its all-time high, hitting roughly $808 in after-hours trading at the time of publishing.